9/10/12 - Appointment - Angers, Musée des Beaux-Arts - Due to Patrick Le Nouëne’s retirement, the museums in Angers will now have a new director as of 15 October, Ariane James-Sarazin, chief curator for Heritage. 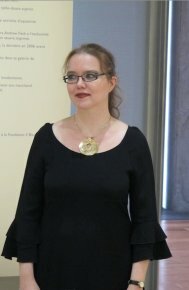 After graduating from the Ecole Nationale du Patrimoine in 1997, she was appointed curator at the Archives Nationales then took over the historical collections of Nestle France. In 2000, she became head of the Département de l’action culturelle et educative at the Musée de l’Histoire de France, the one which already existed inside the Archive buildings before the short-lived "Maison de l’Histoire de France". Finally, from 2009 to 2012, Ariane James-Sarazin has directed the Exhibitions department as the Bibliothèque nationale de France. The new director of the Angers museums is a specialist in old masters. She has been working for several years on the catalogue raisonné for Hyacinthe Rigaud, the subject of her doctoral dissertation presented in 2003 and of many articles. As an archive scholar, she has also published books, articles and exhibition catalogues on French history. There are five museums in Angers . While the Musée des Beaux-Arts underwent a complete renovation a few years ago, the Musée Pincé has been closed for refurbishment for several years already and no reopening date has yet been announced. This will probably be one of the most delicate matters the new director will have to treat. We also hope she will continue to pursue the policy of exhibitions of native Angers artists or those with major works residing at the Musée des Beaux-Arts. These last two years, the shows on Bodinier (see article in French) and Guérin were highly popular. Other Angers artists await this tribute, notably Jules-Eugène Lenepveu extensively represented in the collections (notably the immense preparatory drawing for the ceiling in the Paris Opera), surely long overdue. Le Musée des Beaux-Arts, the Galerie David d’Angers, the Musée Jean Lurçat et de la tapisserie contemporaine, the Musée Château de Villevêque and the Musée Pincé. Next article in News Items : A Civil Servant from the Finance Ministry as Director General for Heritage ?